Nocardia spp. are catalase positive, aerobic, and non-motile Gram-positive filamentous bacteria. Many Nocarida spp. have been reported as unusual causes of diverse clinical diseases in both humans and animals. Therefore, they have been studied for a long time, primarily focusing on strain characterization, taxonomic classification of new isolates, and host pathophysiology. Currently, there are emerging interests in isolating bioactive molecules from diverse actinobacteria including Nocardia spp. and studying their biosynthetic mechanisms. In addition, these species possess significant metabolic capacity, which has been utilized for generating diverse functionalized bioactive molecules by whole cell biotransformation. 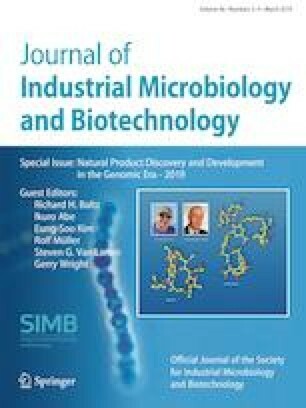 This review summarizes the structural diversity and biological activities of compounds biosynthesized or biotransformed by Nocardia spp. Furthermore, the recent advances on biosynthetic mechanisms and genetic engineering approaches for enhanced production or structural/functional modification are presented. This article is part of the Special Issue “Natural Product Discovery and Development in the Genomic Era 2019”. The online version of this article ( https://doi.org/10.1007/s10295-018-02120-y) contains supplementary material, which is available to authorized users. This work was supported by the National Research Foundation of Korea (NRF) grant funded by the Korea government (MEST) (NRF-2014R1A2A2A01002875, JKS) and (NRF-2017R1D1A1B03036273, DD). The authors want to dedicate this manuscript in honor of Professors Heinz Floss and Chris Walsh for inspiring research in the field of natural products.